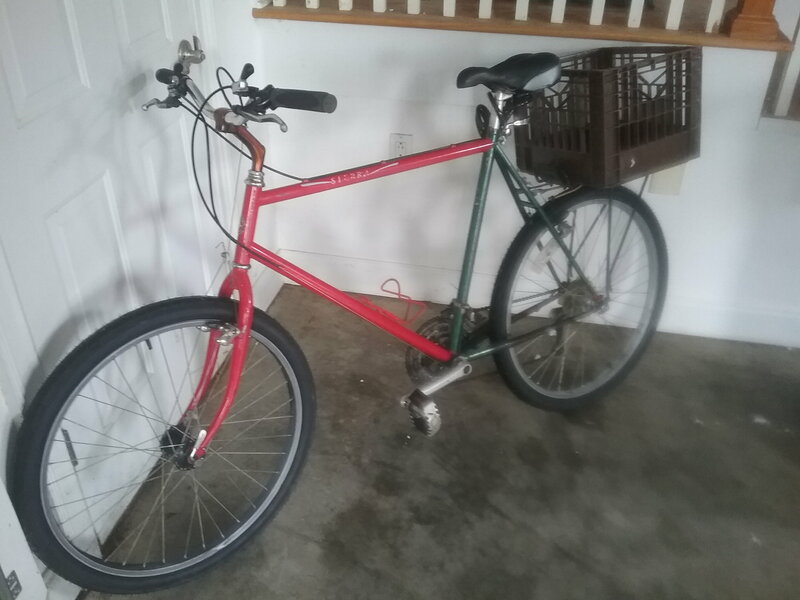 This is a Schwinn Sierra I bought on CL for $40. Came with the rack and knobby tires. Only change I have made are $18 Kenda street tires and a new tube. Any Schwinn-o-philes know what year it is? It's base is a red color. Then someone tried to spray paint it green so now it's half and half. Shifters are the friction handlebar type. Thought it was early nineties but they had indexed thumb shifters I think. I am thinking 1985 to 1987. The headbadge should be stamped with a build date, but the frame could be from the previous year. I am sure that someone here can narrow it down. Maybe that green overcoat can be removed safely. That was #3 in Schwinn's MTB lineup. interestingly (or not)...there is no number on the badge. I thought it was mid-eighties, but when I looked through online catalogues the color I have wasn't listed. It's decent enough for my short (less than 10 miles) trips to the grocery store. Color can help, it is not definitive. I am surprised that there is not a stamp on the badge. When you clean it up, look everywhere for stamped numbers including parts if they are original. Google "vintage schwinn catalog" and see if you can narrow it down by looking at the spec sheet. The wheel base is too long for early '90s. The chainstays were much shorter by then. More pics? Are the shifters friction or index shifters set ion friction mode? Any pics of the components? Derailleur is Shimano STX if that helps...on the rear. I think it's 87 and I believe that it came Shimano equipped. I do think that both derailleurs and the front wheel have been replaced. The serial number should eliminate all the guesswork. I agree but again, there is no serial number on the badge or anywhere else I looked. Interesting! Thanks! How do you know all of that? I agree since one derail says suntour and one shimano at least one would have been replaced but how do you know both were? And how do you know the front wheel was replced? I've had a couple of those in the past 84' and 86' neither of those had that type font, the later run of those also had another different that was an Avant-garde ish style. Mine both had Shimano gearing with similar cranks, one was 12 the other 15 speed, the STX rd came out in the 90's. Both of mine had wheels that looked like the rear on the one above. There were black rims at the time but not many black hubbed bikes of the era. Ok I just looked again. Does that have a seatlug? Pretty sure '87 is right. I googled specifically "1987 Schwinn Sierra" and got pictures of Sierras in this color and with the Sierra graphic. Nice going! Another odd thing about this bike....the largest sprocket in the triple has 48 teeth...isn't that what most road bikes have? 1987 model year. The frame serial number is stamped on the BB on the non-drive side. Edit: The frame was manufactured by Giant of Taiwan. No road bikes had 52+/-. I would agree it is a 86-87 model with some changed components. Not really special but nice vintage hard frame MTB it's worth about $150-175 as a rider in good working order. It was probably manufactured by Giant but you can't say for sure without the serial number. Most bicycle companies did not sole source their bicycles. They typically had a 2nd source to which they allotted a small percentage of their volume. This way they had a reserve company to which they could shift production in case the primary source ran into problems (i.e strike, fire, machine breakage, etc.). It is a fairly common occurrence to see a particular model of bicycle being manufactured by multiple sources within a single model year. So, even if we have seen previous cases of this model and year coming from Giant, that doesn't mean that they were all manufactured by Giant. Last edited by T-Mar; 03-14-19 at 06:53 AM. Do you have an example of a 1987 model year Schwinn Sierra frame manufactured by a manufacturer other than Giant?